Monterey, California -truly a mecca for Naval Innovation – held its first Athena Project Pitch Event back in August at the London Bridge Pub. In a room with a view overlooking historic Monterey bay, six presenters from both Naval Postgraduate School and Defense Language Institute took the stage and brought their big ideas out into the light of day. Soldiers, Sailors, Marines, and academics from a myriad of backgrounds filled the room not only with their presence, but also their enthusiasm and curiosity. CDR Andy Newsome, who brilliantly brought two massive commands together and then organized Athena Monterey 1.0, emceed the event. Volunteers from the audience pulled names out of the cup for the order of the presenters… and then were subsequently awarded an Athena Monterey 1.0 custom-designed coin which was 3D-printed at NPS’s Maker Space, Robo Dojo. The presenters then each had 5 minutes to present their idea and then another 5 minutes to answer audience questions. The evening proved to be electric as compelling insights unfolded one right after another both from the presenters and those who came to support. Here is a quick encapsulation of the concepts presented. Navy LT Todd Coursey, a heavyweight in the Navy’s additive manufacturing and Maker Space movement , started the evening off by capturing our attention by bringing in a box about twice the size of a large shoe box. His concept aimed at enabling senior officer and enlisted leadership exposure to advanced digital manufacturing and coding capabilities. Todd said that this generation is growing up in an environment where digital capabilities have become democratized to the point where seven year olds in third world nations can be taught to create micro-controllers. Curiosity piqued, he explained to the wide-eyed audience that this box is actually a portable additive manufacturing tool that has the potential to disrupt coding and digital manufacturing education easily and widely, opening up military and civilians to endless possibilities when coupled with a cohesive, creative, and cost-effective curriculum. By giving leaders a three to five day dose of the realm of the possible when it comes to current technology and how easy it is to employ. Nick AionaAka delivered Athena’s first Marine Corps pitch, bringing to the crowd a very relevant and timely idea that will flip collaboration and leadership shortfalls head over heels and into the future with wings. A big believer in organization culture as the root of all innovative commands, Nick offers that giving units or unrelated groups of DoD personnel take a tactical pause and step out of the forest so they can see the trees, could prove just the ticket to help us experience and discuss key pillars such as trust, communication, collaboration, connectedness, and other cultural nuances that are necessary for next generation ingenuity to thrive. But Nick also states that stepping out of the forest proverbially can happen by stepping in an actual forest. Getting back into nature and around a campfire are the best ways to remind ourselves that authentically connecting and learning from one another has a great deal of meaning when we are doing in our most simplest environments. NPS Professor Peter Ateshian left the audience in awe when he explained how Femto-Satellites could rewrite the books on how we communicate. With his son by his side, Peter brought a prototype of an actual size satellite… which was ridiculously small by the way… and passed it around the audience so we could truly understand just how disruptive and enhancing this technology could be. Not only can these miniature satellite carry a signal which provide timing and position, they work in our atmosphere, in space… and can float in the ocean. Lasting 6-8 weeks, the mini-sats cost a meager $30 a pop and the capabilities that can be provided are absolutely endless. Over from Defense Language School, Army CPT Sarah Martin followed up next and presented a solution set that could increase effective recruiting of amazing foreign language instructors – The “Unicorns.” Finding exceptional language instructors at DLI is no easy task… hunting needles in haystacks, especially for obscure languages. Sarah believes we can not only find a wider selection of instructor candidates to teach our Sailors, Soldiers, Airman and Marines, but they can be found with lesser manpower… simply by harnessing the power of social media. Using sites like Facebook, LinkedIn, Twitter… even Snapchat and Instagram can be used to reach specific audiences… namely language instructors in this case. By capitalizing on public demographic information that users provide to social media sites, DLI can include this into their marketing and recruiting strategies. Targeting ads through Facebook, for example, can cost very little… as much as $0.24 a click… sometimes event less. And without being invasive, it allows people who possess the skillsets needed to teach a language to find out about employment opportunities at DLI they might not have otherwise known about. Sarah’s idea wowed the audience as she was peppered with questions and idea riffs following her presentation. Chief John-Mark Allen stirred the crowd by asking anew the question every person in the Department of Defense has pondered at some point… What ever happened to the notion of a paperless Navy? His question was has been asked for over 18 years now since it was first proposed in 1998. And though there are some places where we have gone paperless, for example using NSIPS to route leave documents, we still have no shortage of blue and red folders plaguing commands. Breaking the old paradigm requires a culture shift, and Chief Allen proposes posing an internal “tax” on paper and toner. By increasing the price of paper and toner, commands will be pushed to adopt to myriad of other solutions for electronically routing documents. Our last presenter, LT Jesse Iwuji, immediately captured the audiences undivided attention by taking the stage in his NASCAR racing gear. As it turns out, we have within our Navy ranks a bonafide NASCAR driver… and one of two African American drivers in the circuits. When he’s not the Director of Student Services at NPS, Jesse hits the track. Jesse proposed using his influence within the NASCAR racing fan base to promote and recruit for the Navy. Because he is the only active duty driver and a minority on the circuit, Jesse attracts the camera nearly every single race. He garners an average of $1.5 million dollars worth of airtime, which is actively promotes the Navy because he’s a proud Surface Warfare Officer. However, there is more potential. The Navy could easily capture an even bigger ROI by being the only service in history to sponsor a car driven not only by their own service member, but an active duty one at that. It’s a no brainer… which is why Jesse won the Admiral Sims Award for Intellectual Courage. 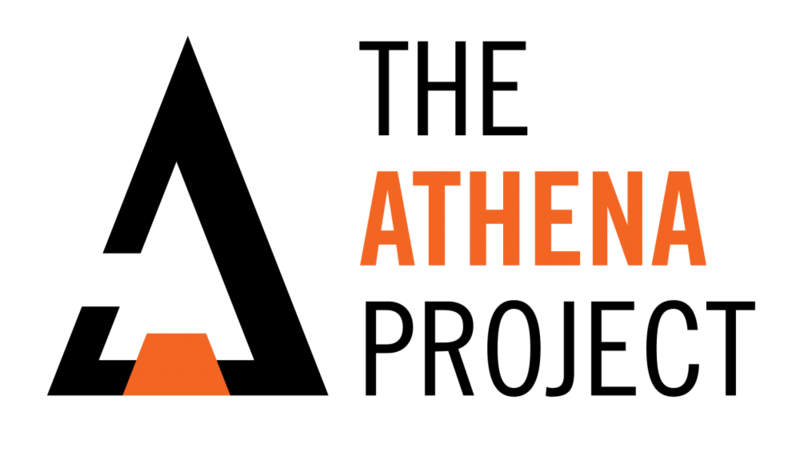 Plans for Athena Monterey 2.0 and updates on our presenters coming soon… so stay tuned!